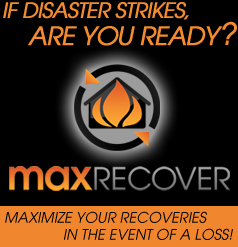 MaxRecover™ provides a complete interactive 360° Virtual Tour of your home or business to document everything you own for insurance purposes in case of a loss. We will provide a copy of your Virtual Tour for your records and securely store a copy in our local and cloud servers, making it available whenever you need it. Even if your house is burned to the ground or has been hit by a tornado, you will still be able to “virtually” visit it and “walk through” it, proving ownership of your goods for insurance purposes. - Several options for documenting special items such as jewelry, instruments, antiques, items with serial numbers, etc. Don't make yourself have to go through the extra stress of having to remember everything to list and report to your insurance company... Believe us, you will be going through enough stress already, so let us relieve some of that stress beforehand. Record it now! Don’t regret it later! This is a priceless investment! on this NEW and INNOVATIVE TECHNOLOGY! Click here to learn about our NEW Interactive Insurance Virtual Tour! Copyright © 2019. Distinx Technologies.